Both of the Wilburys singles from their first album were very obviously singles. The songs open and close the album, and they are the only ones on which most of the band has a featured vocal part. 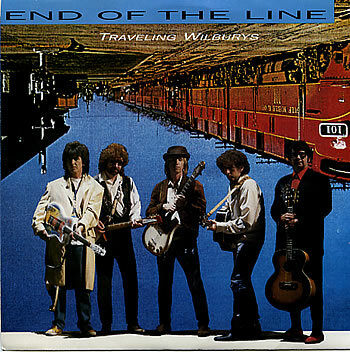 “End of the Line”, actually, does not feature a Dylan vocal; Harrison, Lynne, and Orbison take turns singing the chorus while Petty sings all of the verses. 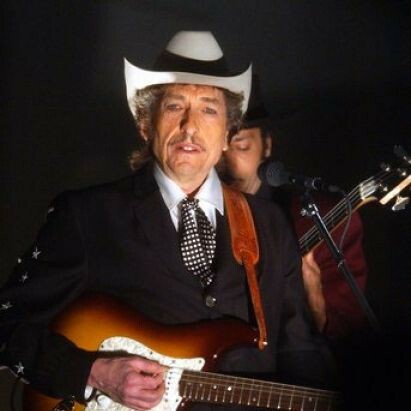 Dylan can be heard harmonizing on the one line (“End of the Line”) throughout. Many of the other songs on the album are fairly straight solo songs by the songwriter with the rest of the act serving as guest stars, but this and “Handle Me With Care” are the clear showcases for the group as a group. The video is pretty basic – the four men play guitar around an empty chair that holds Orbison’t guitar on a set made to look like a moving train. Simple and straightforward. A tasteful tribute to the late, great Roy Orbison.